I’ll be honest – I actually wanted some pump dispensers for another activity, so bought some liquid hand soap from the dollar store. But it pained me to just pour it all away without using it, so I decided to make bubble dough! 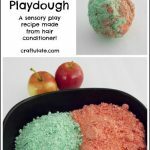 I’d seen recipes that use shampoo or dish soap, but then I read a post from Creative Playhouse that suggested hand soap or shower gel could be used. You can make bubble dough without the oil but apparently it makes it softer and stretchier, so that sounded like it was worth including to me! I mixed everything together and it was SUPER sticky. But after adding a little more cornstarch and some kneading it turned into a proper dough. Although I did get some help! The finished dough was really soft, and had something marshmallowy about it. It was somehow crumbly and moldable all at the same time! And of course it smelled fantastic! F had a good time pulling, pushing and working with this dough. It wasn’t like our normal homemade play dough, but it’s useful that this is a no-cook recipe so that my son could help me make it.